Home Expert Advice Skincare Advice Myths Are Parabens a Problem? For years, parabens have been the target of well-intentioned, but ultimately misleading, information about being the cause of certain health issues. You might be wondering why parabens are used in cosmetics in the first place. They’re a group of preservatives that help prevent the development of harmful organisms that would otherwise thrive in makeup and skincare products. So, how did they get such a bad rap? The reason there’s concern about parabens is because of research suggesting they can alter or disrupt how some biological systems work, potentially leading to health problems. There are also claims that parabens can cause skin to break down. The problem? The studies that used to make these alarming allegations didn’t take into consideration how parabens are used in cosmetics products. In some studies, high concentrations (up to 100%) of parabens were used. 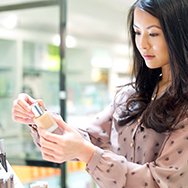 Much lower amounts, usually less than 1%, are used to preserve cosmetics. In other studies, large quantities of parabens were fed to lab animals, not applied topically as they are with skincare and makeup products. Let’s clarify a common misconception: Most ingredients applied to skin do not get into the body. They remain within skin’s uppermost layers where they do the most good. One of skin’s natural roles is to shield the body from external influences, and that includes things we apply to it. Besides, if all those ingredients sailed right through skin, nothing would be left to protect it and lead to visible improvements. If you choose to use products that don’t contain parabens, that’s a personal decision—but know that parabens are among the most-researched and safest ingredients to use when it comes to effectively preserving the makeup and skincare products we love.